Philosophers (1917) by Mikhail Nesterov, depicting Pavel Florensky and Sergei Bulgakov. Russian philosophy includes a variety of philosophical movements. Authors who developed them are listed below sorted by movement. While most authors listed below are primarily philosophers, also included here are some Russian fiction writers, like Tolstoy and Dostoyevsky, who are also known as philosophers. 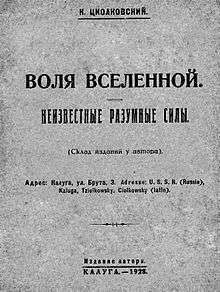 Russian philosophy as a separate entity started its development in the 19th century, defined initially by the opposition of Westernizers, advocating Russia's following the Western political and economical models, and Slavophiles, insisting on developing Russia as a unique civilization. 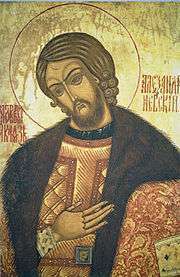 The latter group included Nikolai Danilevsky and Konstantin Leontiev, the early founders of eurasianism. The discussion of Russia's place in the world has since become the most characteristic feature of Russian philosophy. In its further development, Russian philosophy was also marked by deep connection to literature and interest in creativity, society, politics and nationalism; cosmos and religion were other notable subjects. Notable philosophers of the late 19th and early 20th centuries include Vladimir Solovyev, Vasily Rozanov, Leo Tolstoy, Sergei Bulgakov, Pavel Florensky, Nikolai Berdyaev, Pitirim Sorokin, and Vladimir Vernadsky. From the early 1920s to late 1980s, Russian philosophy was dominated by Marxism presented as dogma and not grounds for discussion. Stalin's purges, culminating in 1937, delivered a deadly blow to the development of philosophy. A handful of dissident philosophers survived through the Soviet period, among them Aleksei Losev. Stalin's death in 1953 gave way for new schools of thought to spring up, among them Moscow Logic Circle, and Tartu-Moscow Semiotic School. Nikolay Fyodorov (1829–1903) N O Lossky lists Fyodorov as primarily a Christian philosopher. George Plekhanov (1856–1918) The first major Russian Marxist thinker. Vladimir Lenin (1870–1924) The founder of Leninism. Leon Trotsky (1879–1940) The founder of Trotskyism. Solovyev is noted to have created the first complete encompassing system of Russian philosophy. Russian Philosophy. English-Russian Dictionary (ed. Vasily Vanchugov). Moscow, People's Friendship University of Russia, 2005. History of Russian Philosophy «История российской Философии »(1951) by N. O. Lossky. Publisher: Allen & Unwin, London ASIN: B000H45QTY International Universities Press Inc NY, NY sponsored by Saint Vladimir's Orthodox Theological Seminary. A History of Philosophy, Volume 10: Russian Philosophy (1986) by Frederick Copleston. Publisher: Continuum, London. Russian philosophy—entry in the Internet Encyclopedia of Philosophy.